CPAP stands for Continuous Positive Airway Pressure. 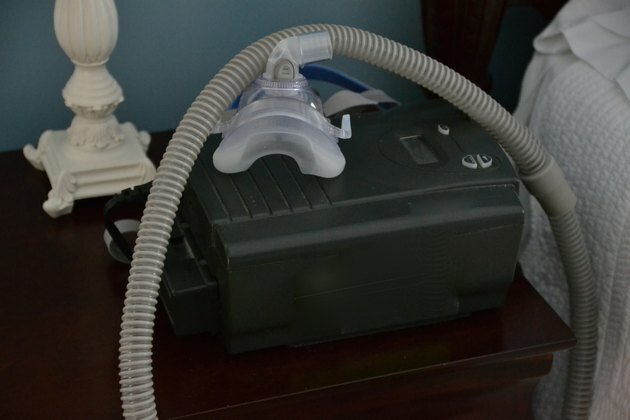 CPAP is used by people with obstructive sleep apnea syndrome (OSAS) during the night to help keep their airways open. CPAP can be delivered either by mask or by nasal cannula. OSAS is diagnosed by sleep studies that show that sufferers stop breathing many times in the night, although they're not aware of it. There are a few side effects--some positive, some negative--associated with long-term CPAP use. According to an article published in the "European Respiratory Journal" in 2000, long-term advantages noted in a one-year study showed that CPAP users had decreased sleepiness during the day, increased reaction times, better memory and improved driving ability over their pre-CPAP testing. A study published in the journal "Chest" in 2005 found that long-term CPAP use resulted in a decrease in deaths from cardiovascular disease. According to T. Jiva, M.D., director of the Sleep Disorders Clinic, other long-term health benefits include a decreased risk of stroke, and decreased depression and anxiety. Weight loss and hypertension have also been reported as long-term benefits of CPAP. A study reported in "Chest" in the Oct. 9, 2007 issue reported that using CPAP over the long term reduced blood pressure modestly overall, but significantly in people who had high blood pressure when they started using CPAP. Long-term CPAP use can also have negative effects. Some long-term negative effects are bloody nose, nasal dryness, stomach distension from air, aspiration of food and damage to the lung, according to Dr. Jiva. How Does a BiPAP Machine Work? Can Acid Reflux Cause Choking at Night?